Drs. Baroud and Talih are with the Department of Psychiatry, American University of Beirut Medical Center in Beirut, Lebanon. Dr. Hourani is with the Department of Diagnostic Radiology, American University of Beirut Medical Center in Beirut, Lebanon. 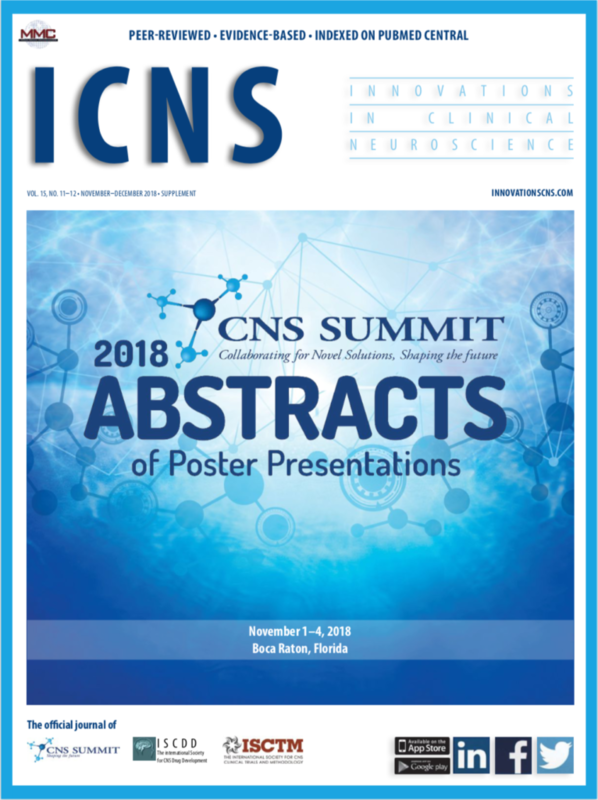 Abstract: We report two cases of patients who presented with psychiatric symptoms and were found to have brain changes on magnetic resonance imaging. In the first case, a 19-year-old man presented with erratic behavior and odd, paranoid ideas. Imaging of the brain revealed a focus of high FLAIR signal involving the left globus pallidus. The second case was a 21-year-old woman who presented with irritability, racing thoughts, and suicidal ideation. Brain imaging revealed nodules of heterotopic grey matter in the right inferior frontal white matter and foci of subcortical heterotopia with thickening of the adjacent cortex. Both patients received psychotropic medications and showed improvement of their symptoms.Integrating neuroimaging in the evaluation of new onset or atypical psychiatric presentations might be of value in specific cases. It is important to develop clear guidelines for the use of imaging modalities in clinical psychiatric practice. We report two cases of patients who presented with psychiatric symptoms and were found to have abnormalities on brain imaging. We discuss the importance of neuroimaging in the workup and evaluation of new onset psychiatric presentations. A 19-year-old, male, first-year university student presented to the emergency department (ED) for erratic behavior and symptoms of odd, paranoid ideas. He was referred by a concerned teacher. The patient reported that he had had paranoid persecutory delusions and prominent ideas of reference for the past several weeks. He also reported anxiety and inability to concentrate, which resulted in an academic decline and social isolation. While interviewed, he reported feeling constantly watched and spending many hours on the internet analyzing social media posts that he felt were hostile or critical toward him or his family. He reported his firm belief that he was under surveillance by terrorist organizations and that prominent world leaders were sending messages to him through social media. He denied thought broadcasting or thought insertion. He denied any substance use, including alcohol or nicotine. He reported at least one year of anxiety symptoms that began after he was bullied in his final year of high school. He had been prescribed buspirone 5mg once daily but was not adherent with the treatment. His medical and surgical histories were otherwise unremarkable. Family history revealed that his mother had a chronic psychotic disorder. Physical examination, including a complete neurological examination, on admission to the psychiatric unit was unremarkable. Vital signs were within normal parameters. During his mental status examination (MSE), he appeared well-groomed, showed good hygiene, and was cooperative with the examiner. His mood was anxious; his affect was blunted and non-reactive. He reported feeling sad and fearful. No mania was evident. His speech was monotonous and pedantic. His thought process was circumstantial and disorganized. His thought content was positive for paranoid delusions and ideas of reference. He was not suicidal or homicidal. Urine drug toxicology was negative. Laboratory testing, including complete blood count, electrolytes, creatinine, and liver enzymes, were within normal parameters. 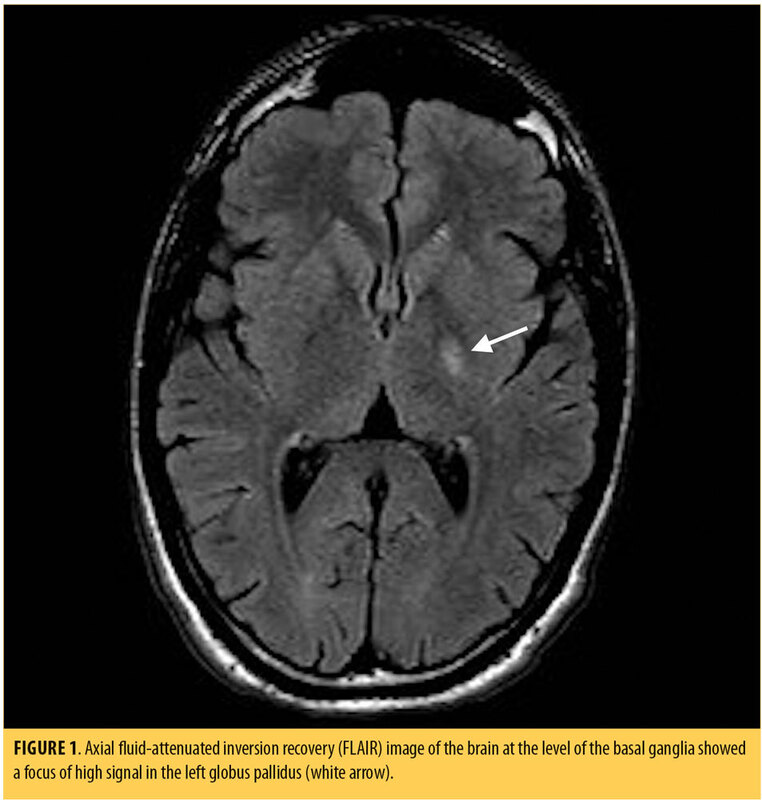 MRI of the brain revealed a focus of high fluid-attentuted inversion recovery (FLAIR) signal involving the left globus pallidus (Figure 1). He was started on olanzapine 5mg twice daily for psychiatric symptoms, and hydroxyzine 50mg once daily, as needed, for insomnia and anxiety. After 48 hours, his thought process became more organized, and his ideas of reference and paranoia improved significantly. He was discharged on Day 3 post-admission into the care of his father. The patient was instructed to continue his medications and to follow up with the psychiatry clinic and student counseling services. Over the next month, the patient continued to show gradual improvement, with resolution of the psychosis. He also maintained good insight and performed well academically. He remained stable at follow-up approximately one year after hospital admission and continued taking olanzapine 5mg at bedtime. A 21-year-old woman who was a third-year university student presented to the ED with a one-month history of anxiety, irritability, racing thoughts, and suicidal ideation. In the week prior to presentation, she developed new onset paranoid thoughts toward her roommate and mother. She reported severe mood changes, insomnia, impaired concentration, and a serious functional and academic decline. Historically, the patient showed a pervasive pattern of interpersonal problems, impulsivity, and self-harm since her late teens. She had attempted suicide multiple times by medication overdose but was never hospitalized or treated following these attempts. Her last suicide attempt occurred one month prior to presentation by ingestion of acetaminophen and alcohol. She was involved in a motor vehicle accident (MVA) approximately four months prior to presentation, where she suffered head trauma but no loss of consciousness. A computed tomography (CT) scan of the brain performed after the accident was unremarkable. She reported episodic use of alcohol and cannabis. There was no family history of psychiatric illness. Her medical history was significant for ulcerative colitis, diagnosed at the age of 3 years, with flares throughout adolescence. At the age of 16, she was started on azathioprine for colitis. Of note, she developed disseminated Ebstein-Barr virus (EBV) infection one month prior to presentation, with associated elevated liver enzymes and subsequent pneumo-pericarditis. She was hospitalized for two days at that time and recovered uneventfully. For the past month, she had been taking mesalamine for colitis. Thyroid function, electrolytes, complete blood count, and liver functions were within normal range. Gamma glutamyl transferase was mildly elevated. Human immunodeficiency virus testing was negative. Urine drug toxicology was negative. Electro-encephalogram (EEG) monitoring was conducted during hospitalization and showed bifronto-temporal slowing and fragments of generalized spike and wave discharge over the right frontal area. A lumbar puncture was performed, and results were within normal ranges with no signs of infection or inflammation. The consultant neurologist concluded that these findings were nonspecific and unlikely the cause of her clinical presentation. Brain MRI revealed nodules of heterotopic gray matter in the right inferior frontal white matter, isointense with the gray matter on all sequences that did not enhance. Additionally, there were foci of subcortical heterotopia, with thickening of the adjacent cortex involving the right inferior frontal gyrus, right insula, right precentral gyrus, and the hand motor area (Figure 2). The patient was started on quetiapine 300mg once daily, which was increased to 900mg daily gradually over a period of three weeks while she was in the hospital, with minimal improvement of her symptoms. Carbamazepine 400mg twice daily was subsequently added to her treatment regimen, and over the next two weeks her mood stabilized and disorganized behavior and thoughts gradually improved. The patient was discharged on the same medications after remaining in the hospital for four weeks and was instructed to follow up in the clinic. Upon follow-up, which was 14 days after discharge, she continued to show improvement in the disorganized and bizarre behaviors but remained impulsive with residual mood dysregulation. The majority of globus pallidus lesions are symmetric, indicating a toxic metabolic process or hypoxia. The lesions are differentiated based on the patient’s age and their MR signal. In Case 1, the lesion was unilateral, and so metabolic/toxic etiologies, such as Wilson disease, hepatic encephalopathy, Leigh syndrome, and hypoxic ischemic encephalopathy, were less likely.7 Furthermore, the described lesion was nonspecific, was found in the gray matter, and was not restricted on diffusion. Therefore, it is unlikely to represent a demyelinating lesion, especially in the absence of other white matter lesions. It might be gliotic or an old ischemic lesion. To the best of our knowledge, there are no previous reports of psychosis associated with foci of high FLAIR signals in the globus pallidus. 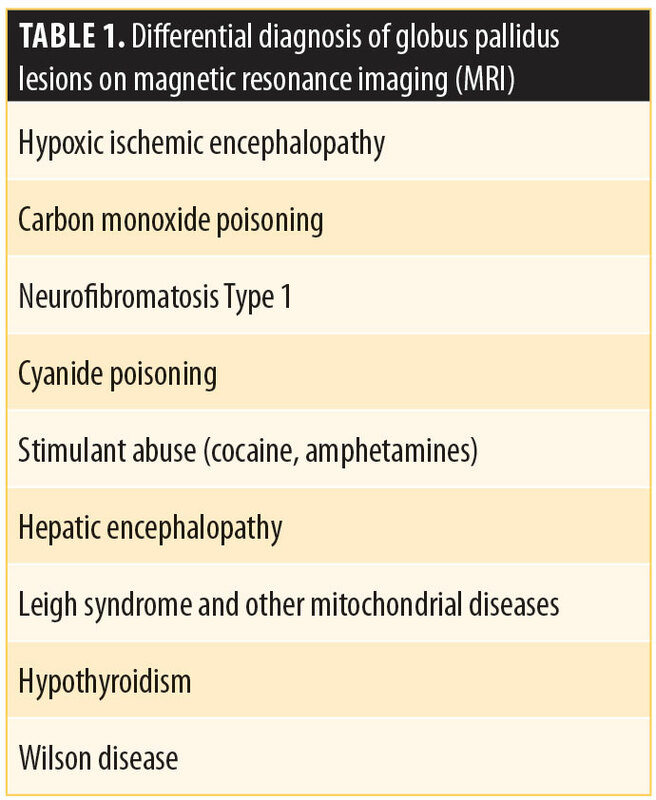 The differential diagnosis in Case 1 included ischemia, neurofibromatosis Type I or toxic causes, such as drug abuse or cyanide/carbon monoxide poisoning, or other metabolic processes given the unilaterality of the lesion. Neurofibromatosis was unlikely in this case, with no clinical evidence for the disorder.7,12 Table 1 summarizes some of the conditions associated with basal globus pallidus lesions on MR.
From a cost-benefit perspective, due to the low yield, it is not economically feasible to image the brains of all patients who present with psychotic symptoms. There is also a lack of quality evidence showing the clinical advantages of neuroimaging in psychiatry; therefore, the outcome from an economic perspective remains unclear.31 Uncertain economic advantage, together with the low yield of brain imaging, radiation exposure risk, and the potential of delaying necessary treatment, might oppose routine neuroimaging.29 Nonetheless, a negative neuroimaging result is also of value because it denotes the “functional” or non-neurological nature of psychotic symptoms, which in turn might make it easier for patients and their families to accept the presence of a psychiatric illness. 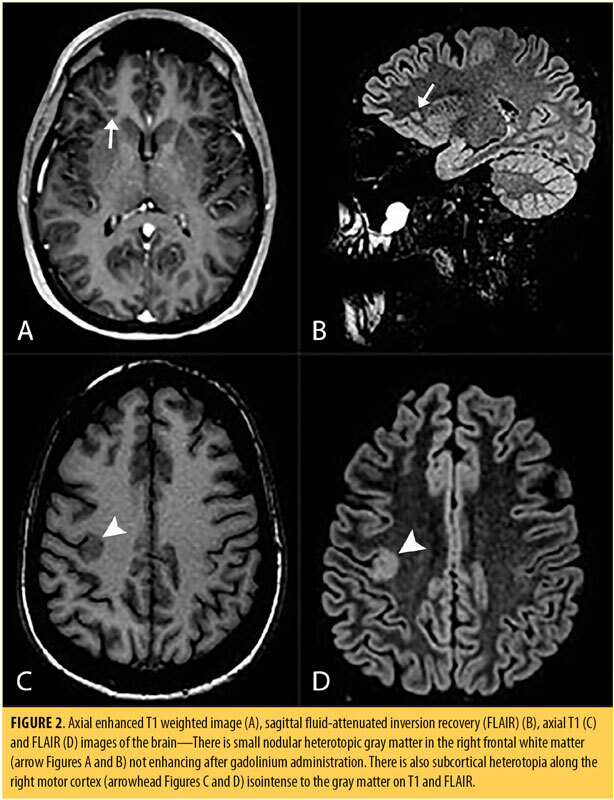 In light of the above, MRI remains a sensitive imaging modality to detect lesions that are commonly associated with psychosis, including white matter diseases, brain tumors, and temporal lobe anomalies.32 A negative MRI remains reassuring in regard to the absence of physiological disease, and when guided by the clinical picture, can rule out potential medical disorders as the immediate cause of psychosis. This is particularity true for Case 2, in which the patient displayed mixed symptoms and an atypical presentation. The second case’s complex and atypical presentation with mixed neuropsychiatric symptoms, including agitation, impulsivity, aggression, cognitive impairment, paranoia, and mood lability—all of which have been reported in association with GMH33—raises the possibility that the MRI scans found the cause of the patient’s symptoms. The patient suffered from a comorbid autoimmune disorder (ulcerative colitis), which should also be taken into consideration due to the reported association between autoimmune/inflammatory diseases and psychiatric disorders.38 Previous treatment for CNS infection or autoimmune disease increases the likelihood of later developing a mood disorder, and underscores the association between inflammation and mood disorders. This is consistent with the presentation of Case 2.39 In Case 2, the patient also suffered a relatively recent concussion due to a motor vehicle accident, which might have exacerbated her neuropsychiatric symptoms. This traumatic brain injury was followed temporally by EBV infection (requiring hospitalization), which was an additional cumulative insult to an already stressed CNS. 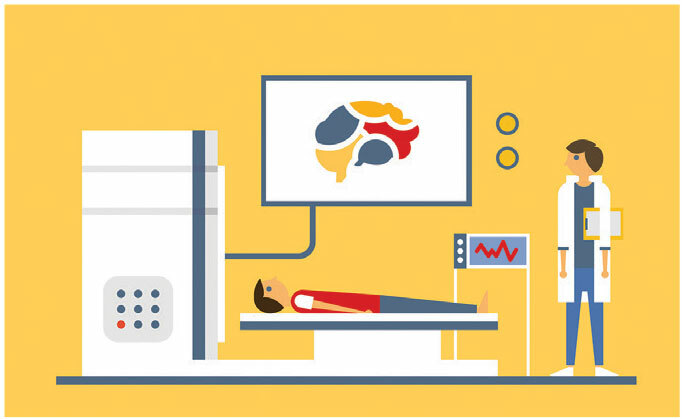 MRI research has helped to establish a neuropathologic basis for psychiatric illnesses. For example, findings of enlarged ventricles and reduced brain volumes are associated with psychosis, whereas mood disorders are associated with high-signal-intensity areas in cortical white matter3 and a decrease in frontal lobe volume.40 The hypothesis is that the prefrontal cortex and, in particular, the subgenual prefrontal cortex, are important structures in mood regulation, and the gray matter volume is found to be reduced in this area in patients41 with unipolar depression and decreased anterior paralimbic and cortical activity as shown by fMRI studies.42,43 Our patient suffered from a neuronal migration anomaly in her frontal lobe with several foci of heterotopia as shown by the MRI, and this might have led to cortical dysfunction in her prefrontal and anterior paralimbic systems. Integration of neuroimaging in the evaluation of first-time or atypical psychiatric presentations is of value in specific cases when clinically indicated. It is important to develop clear guidelines for the use of imaging modalities in clinical psychiatric practice. Malhi GS, Valenzuela M, Wen W, Sachdev P. Magnetic resonance spectroscopy and its applications in psychiatry. Aust N Z J Psychiatry. 2002;36(1):31–43. Power BD, Nguyen T, Hayhow B, Looi JCL. Neuroimaging in psychiatry: an update on neuroimaging in the clinical setting. Australas Psychiatry. 2016;24(2):157–163. Agarwal N, Port JD, Bazzocchi M, Renshaw PF. Update on the use of MR for assessment and diagnosis of psychiatric diseases. Radiology. 2010;255(1):23–41. Stern T, Fava M, Wilens T, Rosenbaum J. Massachusetts General Hospital Comprehensive Clinical Psychiatry. Elsevier; 2008. Camprodon JA, Stern TA. Selecting neuroimaging techniques. Prim Care Companion CNS Disord. 2013;15(4). Bekiesinska-Figatowska M, Mierzewska H, Jurkiewicz E. Basal ganglia lesions in children and adults. Eur J Radiol. 2013;82(5):837–849. Lanciego L, Luquin N, Obeso A, et al. Functional neuroanatomy of the basal ganglia. Cold Spring Harb Perspect Med. 2012;2(12):1–20. Utter AA, Basso MA. The basal ganglia: an overview of circuits and function. Neurosci Biobehav Rev. 2008;32(3):333–342. Tremblay L, Worbe Y, Thobois S, et al. Selective dysfunction of basal ganglia subterritories: from movement to behavioral disorders. Mov Disord. 2015;30(9):1155–1170. Sadock BJ, Sadock VA, Ruiz P. Kaplan & Sadock’s Synopsis of Psychiatry, 11th eds. New York: Wolters Kluwer; 2015. Beltz EE, Mullins ME. Radiological reasoning: hyperintensity of the basal ganglia and cortex on FLAIR and diffusion-weighted imaging. Am J Roentgenol. 2010;195(3_supplement):S1–8. Osborn A, Ross J, Salzman K, et al. Expert DDX Brain and Spine. Amyrsis. 2009;86–90. Abdullah KHA, Saini SM, Sharip S, Rahman AHA. Psychosis post corona radiata and lentiform nucleus infarction. BMJ Case Rep. 2015;2015(figure 1, pg 3). Farid F, Mahadun P. Schizophrenia-like psychosis following left putamen infarct: a case report. J Med Case Rep. 2009;3(1):7337. Srivastava S, Agarwal MP, Gautam A. Post stroke psychosis following lesions in basal ganglion. J Clin Diagn Res. 2017;11(5):VD01–VD02. Walther S, Stegmayer K, Federspiel A, et al. Aberrant hyperconnectivity in the motor system at rest is linked to motor abnormalities in schizophrenia spectrum disorders. Schizophr Bull. 2017;43(5):982–992. Walther S, Strik W. Motor symptoms and schizophrenia. Neuropsychobiology. 2012;66(2):77–92. Mittal VA, Walker EF, Bearden CE, et al. Markers of basal ganglia dysfunction and conversion to psychosis: neurocognitive deficits and dyskinesias in the prodromal period. Biol Psychiatry. 2010;68(1):93–99. Lieberman J, Dixon L, McGlashan T, et al. Practice Guideline for the Treatment of Patients with Schizophrenia. Arlington, VA: American Psychiatric Association Publishing Inc.; 2004. Battaglia J, Spector IC. Utility of the CAT scan in a first psychotic episode. Gen Hosp Psychiatry. 1988;10(6):398–401. Bain BK. CT Scans of first-break psychotic patients in good general health. Psychiatr Serv. 1998;49(2):234–235. Lubman DI, Velakoulis D, McGorry PD, et al. Incidental radiological findings on brain magnetic resonance imaging in first-episode psychosis and chronic schizophrenia. Acta Psychiatr Scand. 2002;106(5):331–336. Khandanpour N, Hoggard N, Connolly DJA. The role of MRI and CT of the brain in first episodes of psychosis. Clin Radiol. 2013;68(3):245–250. Robert Williams S, Yukio Koyanagi C, Shigemi Hishinuma E. On the usefulness of structural brain imaging for young first episode inpatients with psychosis. Psychiatry Res Neuroimaging. 2014;224(2):104–106. Gewirtz G, Squires-Wheeler E, Sharif Z, Honer WG. Results of computerized tomography during first admission for psychosis. Br J Psychiatry. 1994;164(06):789–795. Goulet K, Deschamps B, Evoy F, Trudel J-F. Use of brain imaging (computed tomography and magnetic resonance imaging) in first-episode psychosis: review and retrospective study. Can J Psychiatry. 2009;54(7):493–501. Coentre R, Silva-dos-Santos A, Talina MC. Retrospective study on structural neuroimaging in first-episode psychosis. PeerJ. 2016;4:e2069. Addington D, Abidi S, Garcia-Ortega I, et al. Canadian guidelines for the assessment and diagnosis of patients with schizophrenia spectrum and other psychotic disorders. Can J Psychiatry. 2017;62(9):594–603. Galletly C, Castle D, Dark F, et al. Royal Australian and New Zealand College of Psychiatrists clinical practice guidelines for the management of schizophrenia and related disorders. Aust New Zeal J Psychiatry. 2016;50(5):410–472. Albon E, Tsourapas A, Frew E, et al. Structural neuroimaging in psychosis: a systematic review and economic evaluation. Health Technol Assess. 2008;12(18):iii–iv, ix–163. Freudenreich O, Charles Schulz S, Goff DC. Initial medical work-up of first-episode psychosis: a conceptual review. Early Interv Psychiatry. 2009;3(1):10–18. Lippi G. Neuropsychiatric symptoms and diagnosis of grey matter heterotopia: a case-based reflection. South African J Psychiatry. 2017;23:6. Fry AE, Kerr MP, Gibbon F, et al. Neuropsychiatric disease in patients with periventricular heterotopia. J Neuropsychiatry Clin Neurosci. 2013;25(1):26–31. Pridmore S, McInerney G, Rybak M, Archer S. Psychotic disorder NOS with heterotopia. J Psychiatr Intensive Care. 2006;2(02):118. Bourgeois JA, Nisenbaum J, Drexler KG, et al. A case of subcortical grey matter heterotopia presenting as bipolar disorder. Compr Psychiatry. 1992;33(6):407–410. Felker MV, Walker LM, Sokol DK, et al. Early cognitive and behavioral problems in children with nodular heterotopia. Epilepsy Behav. 2011;22(3):523–526. Cawthorpe D. Temporal comorbidity of mental disorder and ulcerative colitis. Perm J. 2015;19(1):52–57. Benros ME, Waltoft BL, Nordentoft M, et al. Autoimmune diseases and severe infections as risk factors for mood disorders. JAMA Psychiatry. 2013;70(8):812. Steffens DC, Krishnan KR. Structural neuroimaging and mood disorders: recent findings, implications for classification, and future directions. Biol Psychiatry. 1998;43(10):705–712. Ketter TA, Kimbrell TA, George MS, et al. Effects of mood and subtype on cerebral glucose metabolism in treatment-resistant bipolar disorder. Biol Psychiatry. 2001;49(2):97–109. Mayberg HS, Brannan SK, Mahurin RK, et al. Cingulate function in depression: a potential predictor of treatment response. Neuroreport. 1997;8(4):1057–1061. Abou-Saleh MT. Neuroimaging in psychiatry: an update. J Psychosom Res. 2006;61(3):289–293. Malhi GS, Lagopoulos J. Making sense of neuroimaging in psychiatry. Acta Psychiatr Scand. 2008;117(2):100–117.